you may notice there’s a new look ’round here. i have been wanting to revamp she likes to eat for a while and i thought no better time than to celebrate my second “blogiversary”, which i will proudly celebrate in july. probably by myself. with one, or four, of these – my new pride & joy. my husband is not a huge dessert fan. but when there is something he does like, even request, i will bend over backwards to make it. 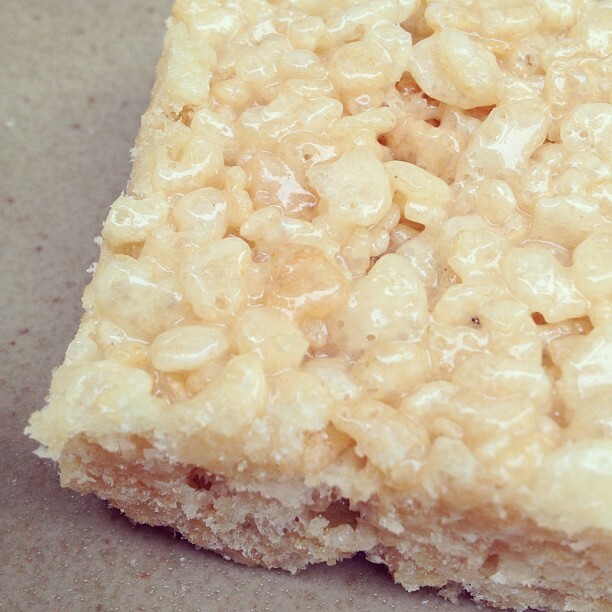 rice krispy treats are one of those things. i think he would say, hands down, it is his favorite dessert. 1. butter a 9×12 baking dish & set aside. in a large saucepan, melt butter over medium heat until just browned. butter will melt, foam, and froth, then begin to brown along the bottom. whisk browned bits off the bottom of the pan. 2. just as the butter begins to brown, add the marshmallows, salt, and vanilla bean sugar. stir with a spatula until mixture is silky smooth and the marshmallow lumps are gone. 3. remove from heat and add rice krispies. stir well, making sure all of the rice krispies are coated in the marshmallow mixture. turn the mixture out into prepared buttered dish. with the spatula, gently press mixture into pan – but don’t pack down too much. **note on vanilla sugar – trust me, you want to get this ingredient. it is so worth it and you’ll use it for baking in the future. if you can’t find it at your grocery store, you can get it here or here. but if you are needing these treats 5 minutes ago/having a serious sweet tooth panic attack, you can substitute 1 tsp sugar and 1/2 tsp vanilla extract. i have not yet made it this way, so i cannot attest to it creating the exact same flavor, but it could work in a pinch. i could have posted this recipe in the “cooking tips” section, it being such a simple & common kitchen basic. but this is the best whipped cream i have made and, like the reason for my starting this blog, i want to shout it from the rooftops. dance about it. 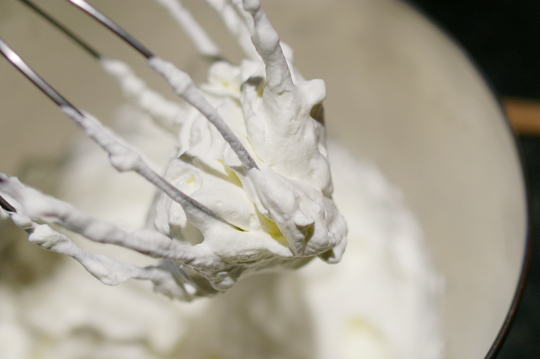 make sure you all know about it, make it, and keep the recipe in your back pocket for every time you need to make whipped cream. or if you’ve just had a rough day and need a little light, fluffy, sweet love. pour heavy whipping cream and vanilla into a large, super cold bowl** (or the bowl of a stand mixer). beat on high for about 45 seconds. add the powdered sugar. continue beating the mixture until stiff peaks form. use immediately for all your whipped cream needs… on top of these waffles, in hot chocolate, as a topping for this sweet potato tart or these lovely pumpkin bourbon milkshakes. or on a spoon. or let’s be honest.. just take the bowl to the table and have at it. ever since getting my first waffle iron this year, one of my favorite easy breakfasts for the little she and myself is buttermilk waffles. i like to make the batter the night before, and then in the morning all i need to do is heat up the iron and scramble us some eggs and breakfast is ready. these buttermilk waffles are perfectly sweet – not overly sugary, which is way too much for me when topped with maple syrup. and yet they are sweet enough for a breakfast on the go, when you are eating them out of your hand with no toppings at all. 1. in a medium sized bowl, whisk together the flour, baking powder, and salt – set aside. beat together butter and sugar. then add eggs and buttermilk. add the dry mixture to the wet mixture and use a spatula to combine. 2. follow directions on your own waffle maker or cover batter and refrigerate overnight (use this tip “on saving dough and batter”). 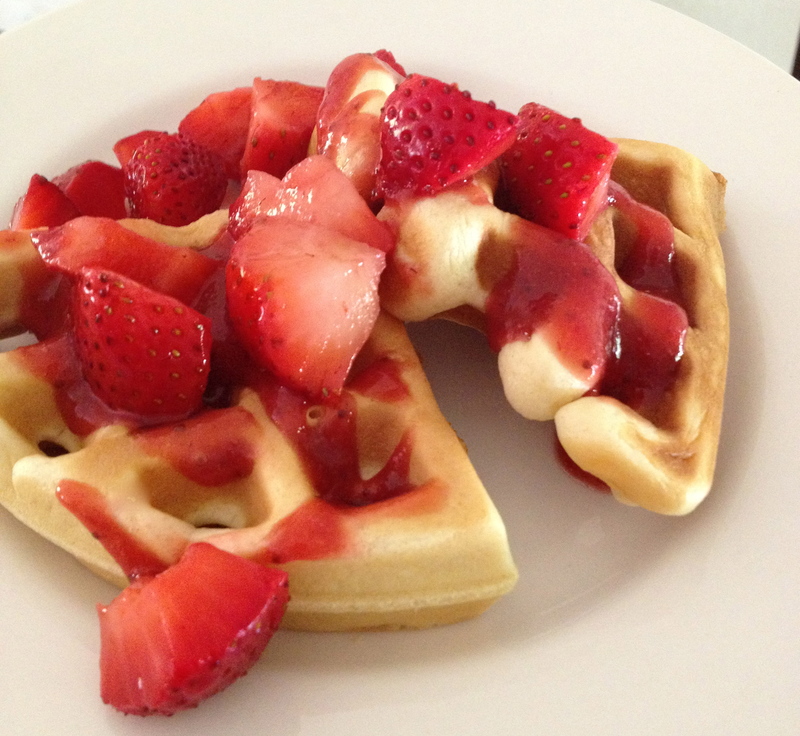 serve warm waffles with fresh strawberries, strawberry sauce, and homemade whipped cream. but they’re also perfectly simple and delicious just with maple syrup.